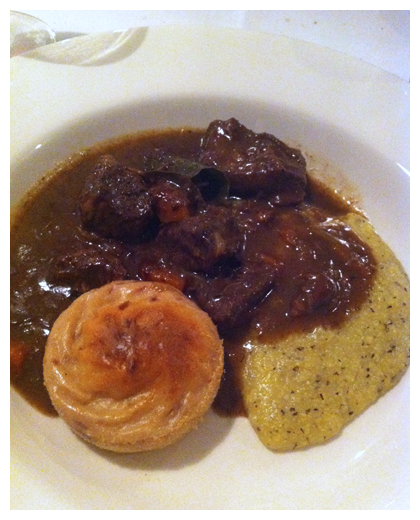 After the fantastic pig dinner we made sure we weren't going to miss the Venison Dinner. 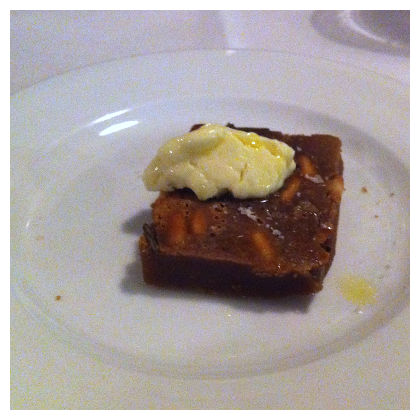 Castagnaccio is one of those dishes that have been quite misunderstood with people insisting on serving it like a cake. It really isn't a dessert, which goes a long way in explaining why people don't like it. Here is one of the best ways to enjoy it and serving it with squacquerone was genius - even Paalo who isn't too found of chestnuts absolutely loved this. 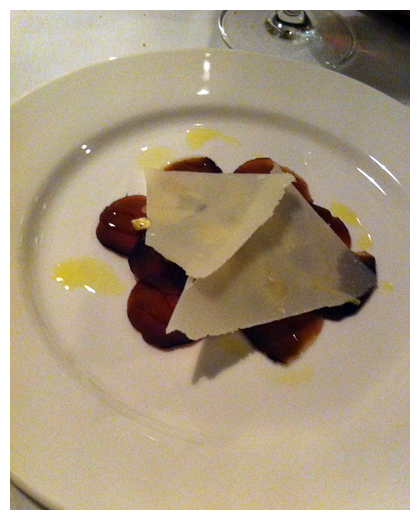 We had a teaser of this in one of our earlier dinners - this proved to be equally tender and delicately flavoured. A real eye opener for those that only see venison as a heavy, winter meat. Judging on the appearance I believe this is the same cut of venison as the carpaccio - the difference is that this has been dried and cured. The meat is darker and firmer but still very tender. 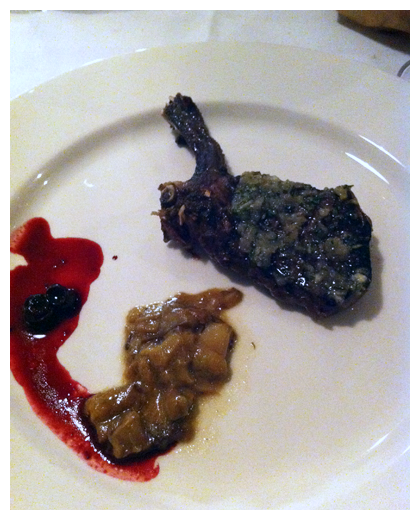 Grilled venison cutlet served with a salsa verde, berry sauce and saute of wild mushrooms. 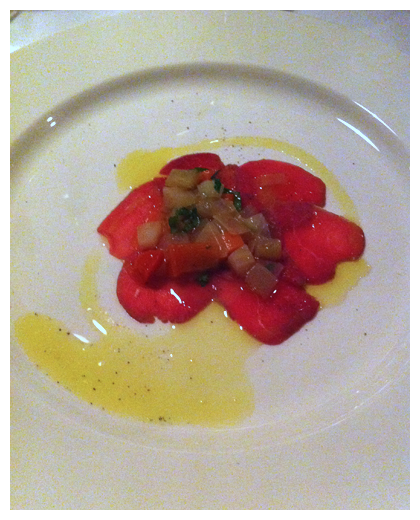 This had us gnawing at the bone to ensure we didn't leave any of that wonderful meat behind. At this stage of the dinner I'm wondering why we don't use venison at home. 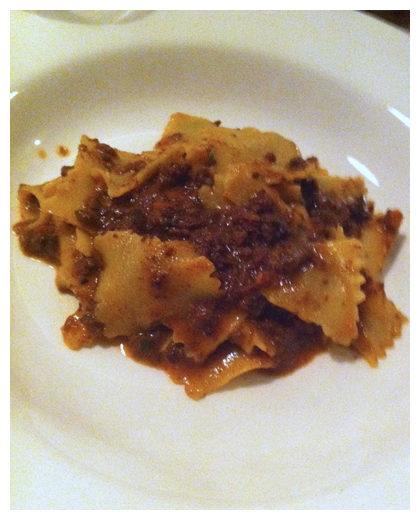 Perfectly cooked pasta, wonderfully wide ribbons coated in a rich, venison ragu. Much bread was used to mop up the sauce. Polenta taragna is a blend of corn meal and buckwheat - the buckwheat add a nuttiness to the flavour and the flavour is a bit more robust - the perfect match for a the stracotto. The venison cubes fork tender. 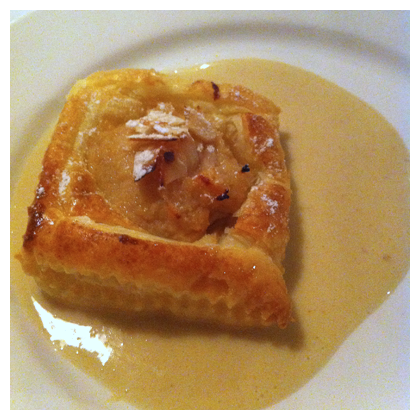 No venison for dessert - a simple apple pastry served with a light custard. It's interesting that we mentioned this dinner to our fellow Eators, their general reaction was that it would be too much venison and that venison is too heavy and too dominating a flavour. I think this dinner has proved that those thoughts need to be revised.